UPDATED: Mon., July 2, 2018, 12:12 p.m.
LEWISTON – A reunion years in the making was finally completed this week as U.S. Marine Nick Montez brought home Mally, a bomb-sniffing dog he served with while in Afghanistan. Montez returned to Lewiston on Tuesday with his companion in hand, ready to give his dog a loving family home where she can peacefully spend the rest of her life. “She’s still just as sweet as she always was,” Montez said. The duo served in Afghanistan and were responsible for finding improvised explosive devices. They were later separated after they returned to the United States. Montez was honorably discharged from the Marines in 2013, while Mally’s services were still needed. People lined up along Memorial Bridge on Tuesday afternoon to welcome home U.S. Marine veteran Nick Montez and his dog, Mally. Montez and Mally worked together while serving in Afghanistan in 2012. Earlier this week the two were reunited for good. She spent her time at Lackland Air Force Base in Texas, where she continued to work. Montez finally got the go-ahead for her adoption earlier this month. As he stood outside of his home in Lewiston on Tuesday, Mally sniffed around the yard, becoming acquainted with her new surroundings. Under her ear is the tattooed number R798, her military identification number. It matches a tattoo Montez has on the backside of one of his calves - the same numbers, a dog paw and “Mally” across the top. He got the tattoo years before he ever knew Mally’s adoption would become a reality. He’d lost hope multiple times, but never gave up. Through the years of trying to adopt Mally, the communications with the Air Force base ceased, but then Sen. Mike Crapo sent a letter. Since then, Montez was in constant contact with Jerry Britt at Lackland Air Force Base. As he arrived at the base from San Antonio International Airport, he was met by Britt, who also seemed moved by the adoption, Montez said. As they went upstairs to complete paperwork, Montez was finally able to lay eyes on Mally again - a moment he said felt surreal. The journey to Lewiston was not an easy one for Mally, he said. The 9-year-old yellow lab has several medical issues and a thick medical file. Thankfully, none of the issues are debilitating, Montez said. The trip to Spokane was likely the first time Mally had been on an airplane since she returned to the United States with Montez after their tour in Afghanistan. “She was great, but she’s been kind of terrified,” Montez said, adding he’s excited to get into a normal routine with his dog. As they approached Lewiston, Montez was surprised when his friend, Patrick Riddle, decided to take over as the driver. That’s when they were greeted by a law enforcement motorcade that escorted them down the Lewiston Grade and over the Clearwater River Memorial Bridge, where dozens of residents had gathered to welcome Mally home. Riding across the bridge, Mally peeked her head outside of the car as the gathering of people cheered and applauded. Laura Grinstead, of Lewiston, was moved to tears. “With everything going on that’s so negative, I wanted to come out and do something positive,” she said. Robin Tietz, of Cloverland, displayed a “welcome home Mally” sign. She said the dog’s service will not be forgotten. Kelly Haberman organized the gathering and also collected a trunk full of toys, treats and other items to help Mally transition into her new life. “This is an incredible story that needs to be celebrated,” she said. Wendy Wilkins and Kristie Spence, both of Lewiston, said the story was so heartwarming, they decided to come show their support. Both proudly displayed flags on the bridge. Ready to start a new life, Mally has everything she needs. Montez plans to donate some of the plethora of donations he received after people from around the nation contributed to his travel expenses. Twenty-five percent will go to the Lewis-Clark Animal Shelter. 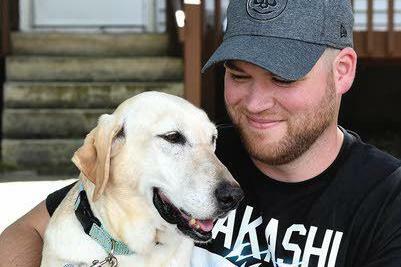 The other 75 percent will be gifted to Mission K9 Rescue, the nonprofit organization that footed his airfare to and from Texas, where he picked up the dog. The organization is dedicated to reuniting retired military working dogs with their owners. Published: July 2, 2018, 10:02 a.m. Updated: July 2, 2018, 12:12 p.m.